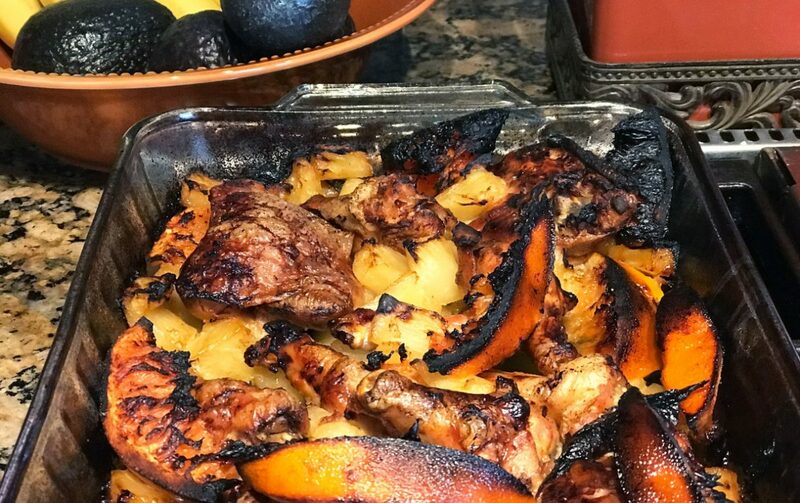 This Cara Cara orange chicken with pineapple recipe was one of those gluten free recipes I made with the ingredients I had available on hand. I was running low on produce and had some fresh chicken that needed to be cooked, and quickly. I went for the canned pineapple and Cara Cara oranges to jazz up this fresh chicken so I didn’t have to return to the market. Cara Cara oranges are navel oranges that are a bit like blood oranges. Their flesh is a ruby pink color. It only took one of these for this recipe, but they’re a big part of what made this chicken so delicious! If you can’t find a Cara Cara, then you can substitute a navel orange instead. I made a big portion for a Monday lunch that carried us into dinner, and even made it to another meal during the week. The house smelled amazing and it hit the spot! 1. Line a 13×9 casserole dish with olive oil. Layer the bottom with one large can of drained pineapple. 2. Place the chicken on top of pineapple. 3. Slice the Cara Cara orange into wedges and place around the edges. The peel adds a nice fragrance and looks gorgeous. 4. Bake at 375º for one hour. Raise temp to 425º and keep a close eye it until top and edges are brown and crispy. I served this with green beans but any veggies will work. If your house is stocked with fresh produce, then a mixed greens salad seems like the perfect accompaniment to this delicious dish!